First and foremost, you need to figure out where to put it. Sure, you probably should have done that before you bought it, and maybe a pulling a tape measure would have been a good idea. Never let pesky details like that get in the way of buying something cool, though. You can make room. How badly do you really need a refrigerator? In a pinch you could sleep under the workbench and gain all that space taken up by the bed. Get creative in your shop layout. If you bought a bench-top machine, you will of course need bench space for it. Some smaller machines, such as watchmaker’s lathes, can be stored in a cabinet and pulled out for use. Anything larger will need a permanent home, and should be bolted to the heaviest bench possible. The more mass you can inject into the system, the fewer issues you’ll have with tool chatter. Mass also damps vibrations when turning stock off-center or spinning up oddly-shaped things. Make sure the bench location you choose is close to power, because extension cords are to be avoided for machine tools. You’ll also likely need a bit of room behind the machine to access fuses and such. If you bought a large floor-standing machine, be aware that these often require access to the back side of them for some types of adjustments and setup. This can mean anywhere from a few inches to several feet, depending on the machine. Large lathes are often placed in the middle of a shop partly for this reason. Big lathes also often need access to an overhead crane or chain fall for changing large chucks, or manipulating heavy stock. The author’s Precision Matthews lathe, bolted to a steel bench, with plenty of space behind and to the left. Regardless of the type of machine, make sure to leave space to the left of the headstock. You need room for long stock to protrude through the spindle. If you’re limited to only working on stock that fits entirely inside the spindle, you’ll limit your projects quite a bit, and you’ll be forced to waste a lot more stock. I also recommend giving a thought to cleaning. Machine tools throw chips everywhere, and all the shields and trays and guards in the world won’t prevent it. Make sure you’ll be able to clean in, around, and behind the machine. You don’t want oily chips piling up forever. In some cases, this can even be a bit of a fire hazard. Next, you want to look down and see what’s there. If your shop is in a bouncy castle, you’re no doubt having fun, but perhaps machining is not for you. (Small children also tend to gum up the change gears, which are a hassle to clean.) A concrete floor is ideal, whether under the machine itself, or under the workbench the machine is sitting on. Wood floors are not ideal for a floor-standing machine, because it shifts and warps. Less stable flooring can be okay, but you’ll need to re-level your machines more often. The same goes for mounting a bench-top machine on a wooden bench. The author’s Precision Matthews lathe on delivery day. With all that sorted out, it’s time to think about taking delivery. New bench-top machines are likely to come on a pallet. Unless you have a loading dock, that means you’ll need lift-gate delivery service, which costs extra. If you’re buying used, don’t assume the seller has any way to put it in your truck. You’ll also need a way to get it off your truck and on to your bench in your shop. An engine hoist (sometimes also called a cherry picker, engine picker, or shop crane) is a great tool for all these jobs. They fold up nicely and are incredibly useful for lots of things around the shop. The rule of thumb for these is to get one at least double the size you think you need. If your machine weighs around 300lbs, get the 2-ton crane. The reason is that the ratings for these are based on the shortest extension of the lifting arm, which renders them useless. They operate (typically) at one-quarter their rating at full extension of the arm. Note that engine hoists can handle up to medium-sized floor-standing machines as well. Just make sure you really know how much it weighs. Using an engine hoist to set a small lathe on its stand. Note the use of a lifting sling, and the properly-chosen lift point around the ways webbing. For a large floor standing machine, you’ll need to get more creative for loading in your truck. Forklifts and front-end loaders are a good option, and can be easily rented. If the seller has a gantry crane or overhead chain fall hoist of some sort, that’s also good. Failing all that, it is possible to winch them up a ramp on to a trailer, but don’t underestimate the difficulty of this for 3000lbs of cast iron. It can easily be an all-day job to load this way, and it’s not the safest option. Unloading is the reverse of loading, as the saying goes (not really — I just made that up). If your machine came with a manual, be sure to follow the lifting instructions therein. Machines often have an unintuitive center of mass, so it can be tricky to know where and how to lift it. Use proper lift slings and good crane etiquette. This means absolutely no meat parts under the load at any time, be in control of the momentum, and always assume the worst is about to happen. Using round bars and a prybar to move a large milling machine. Once in your shop, floor-standing machines can be moved with various methods. A pallet jack is a great option if the machine is already sitting on something that allows you to get under it. Failing that, a common method is to go Full Egyptian. You can jack up the machine a little at a time and slide round steel bar stock under it. With a piece every foot or so, you can roll and slide the machine with a large prybar. It’s possible to move huge machines by yourself using this method. I’ll close with the word that sows dread into the heart of every machine shop enthusiast. That word so heinous that many dare not speak it aloud: Stairs. Yes, the real world often has stairs in it, and people have moved huge machines down narrow basement death ladders. The first rule of doing this is to reduce weight as much as possible. Tear the machine down as far as you can. I’ve seen people strip lathes all the way down to a bare ways in order to slide pieces down the stairs one at a time. If you’re doing a restoration project, this is no big deal because you were going to dismantle it anyway. Plan ahead for this, though. It can be a long project in itself to dismantle a large machine, and you don’t want to be doing that on your front lawn on a school night in the rain. Once you get your machine in situ, it’s time to get set up. Next time we’ll talk all about the fine art of lathe leveling. A physicist will tell you a solenoid simply a coil of wire through which current can be passed. That’s it. Other than in the physics lab, though, such a simple device is not of much mechanical use, so what we tend to think of as a solenoid is slightly more complicated. A practical solenoid has a coil, but it’s also going to have several mechanical parts to make it work as an actuator. A plunger solenoid is a good example of the basics. The air core of the solenoid’s coil is partially occupied by an iron or mild steel plunger, held in place by a return spring. When current is applied to the coil, a magnetic field forms, and the plunger is pulled forcefully into the solenoid’s core. When current stops flowing, the magnetic field collapses, and the return spring forces the plunger back to the resting state. This is characteristic of most solenoids — they’re either actuated or they’re not. This makes them great for jobs that require something to be positioned in either one position or another over a short distance, like valves that stop the flow of liquid through a pipe or tubing. Plunger solenoids range in size from the very tiny to the ludicrously large. On the small side, plunger solenoids see service as actuators for microfluidics valves in scientific and medical applications, and in the drive head for the impact style of dot-matrix printers (yes, each one of those dots is the plunger of a solenoid). You likely interact with medium-sized solenoids on a daily basis. The click at the beginning and end of your refrigerator’s ice maker is what switches the water on and off to refill the tray. You’ll hear a similar click in fountain soda machines. And those pinball wizards among us will attest that the forces throwing that silver ball around the playfield are generated by solenoids. Stepping up the scale, there’s a fairly large solenoid inside the starter motor of almost every car and truck on the road, at least those with internal combustion engines. The solenoid sits atop the starter motor and is responsible for connecting and disconnecting the starter from the system. The solenoid’s plunger is attached to the motor drive shaft via a lever. When the ignition key is turned, the solenoid coil is energized, pulling the plunger in and moving the lever out along the now-spinning motor shaft. This drives a pinion gear out to engage with the engine flywheel to crank the engine until it starts. Other styles of solenoid are available, including rotary solenoids. These are exactly what they sound like: actuators that can rotate between two positions. Designs vary, but the most common types have a permanent magnet rotor on a shaft inside the solenoid’s core. When the coil is energized, the rotor experiences a torque due to the magnetic field, much like the rotor of a permanent magnet motor. The rotor only moves to a physical stop, though, and is returned to the resting position by a spring when the coil is de-energized. If the polarity of the coil is reversed, then the rotor and shaft can swing the other way, making this style of rotary solenoid bistable. Other rotary solenoids use a metal disc with ramped grooves and ball bearings; when the plunger is sucked into the core, the ball bearings force the disc and shaft to rotate along the grooves. As electrically simple devices, solenoids can run on either AC or DC. A DC solenoid tends to be quieter because the magnetic field is constant while the coil is energized. An AC solenoid tends to chatter as the magnetic field varies and the force of the return spring overcomes it at the instant the current changes direction in the coil. This tendency can be mitigated by the use of a shading ring to alter the magnetic circuit of AC solenoids. A shading ring is just a small copper ring that sits inside the core of the solenoid so it contacts the plunger when it’s fully retracted. The magnetic field of the energized coil induces a current inside the ring, which in turn creates its own magnetic field that lags the phase of the solenoid’s field by 90°. When the solenoid’s field falls to zero as the AC waveform passes the zero point, the magnetic flux from the shading ring keeps the solenoid retracted, eliminating the bothersome chatter. While any solenoid will run on AC or DC, care needs to be taken to observe the coil’s specs. Solenoids represent an inductive load, and so their impedance is much higher in AC applications. So if a solenoid rated for 24 VAC were powered by 24 VDC, it would probably burn out quickly as the current through it would exceed the design specs. This could be avoided with a current limiting resistor or by lowering the DC supply voltage. Like their cousin the relay, solenoids have the potential to damage whatever circuit is controlling them. When the current flowing through a solenoid or relay coil is removed, the voltage spikes as the magnetic field collapses. If that spike gets into sensitive components, like a transistor driving the coil, the device could be destroyed. The classic remedy for this with DC coils is the snubber diode, connected in parallel across the coil with the anode on the negative side. The snubber gives the induced current somewhere to go when the power is removed from the coil to prevent it from inducing the high voltage spike. Snubber diodes won’t work on AC coils, so an RC snubber, with a small resistance and capacitance in series with each other placed in parallel across the coil, serves the same purpose. This is only a brief look at what solenoids are and do, and how to incorporate these mechanisms into your designs. We describe a new training methodology for generative adversarial networks. The key idea is to grow both the generator and discriminator progressively, starting from low-resolution images, and add new layers that deal with higher resolution details as the training progresses. This greatly stabilizes the training and allows us to produce images of unprecedented quality, e.g., CelebA images at 1024² resolution. We also propose a simple way to increase the variation in generated images, and achieve a record inception score of 8.80 in unsupervised CIFAR10. Additionally, we describe several small implementation details that are important for discouraging unhealthy competition between the generator and discriminator. Finally, we suggest a new metric for evaluating GAN results, both in terms of image quality and variation. As an additional contribution we construct a higher quality version of the CelebA dataset that allows meaningful exploration up to the resolution of 1024² pixels. This orange battery was built by photographer Caleb Charland (previously) as part of his ongoing alternative energy photographs using fruit, vegetables, and other objects to create light for his long-exposure photographs. The electricity powering the lightbulb inside the orange is generated through a chemical reaction between citric acid and the zinc nails inserted into each wedge. I think this is by far the most lovely piece he’s done in the series, but before you start work on a bunch of orange lights to keep on the nightstand, the light generated was so dim this particular photograph required a 14 hour exposure. 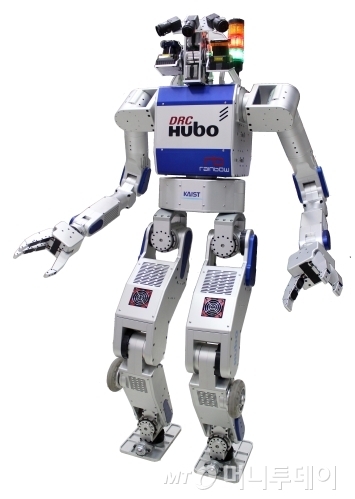 Team KAIST hat mit dem DRC-Hubo gestern in Pomona/Kalifornien die DARPA Robotics Challenge gewoonen, einen von DARPA (einer Behörde des US-Verteidigungsministeriums) organisierten Wettbewerb für humanoide Roboter. KAIST steht übrigens für “Korea Advanced Institute for Science and Technology” und ist die führende Technische Universität in Korea. (Formal ist auch mein Institut, das “Korea Institute for Advanced Study”, dem KAIST angegliedert, räumlich sind wir allerdings fast 150 Kilometer vom Hauptsitz in Daejeon entfernt.) Ich hatte vor 2 Jahren mal einen Artikel über das Discovery Center in Daejeon geschrieben, dessen Attraktion die humanoiden Roboter sind, die in einer 20-minütigen Show zum Beispiel auf Zurufe reagieren und mit den Kindern Schere-Stein-Papier spielen. Auf YouTube gibt es schon ein neues Video über den diesjährigen Wettbewerb. Das Video ist fast 4 Stunden lang, aber es ist auch schon interessant, einfach mal zwischendurch an ein paar Stellen beliebig hineinzuklicken. 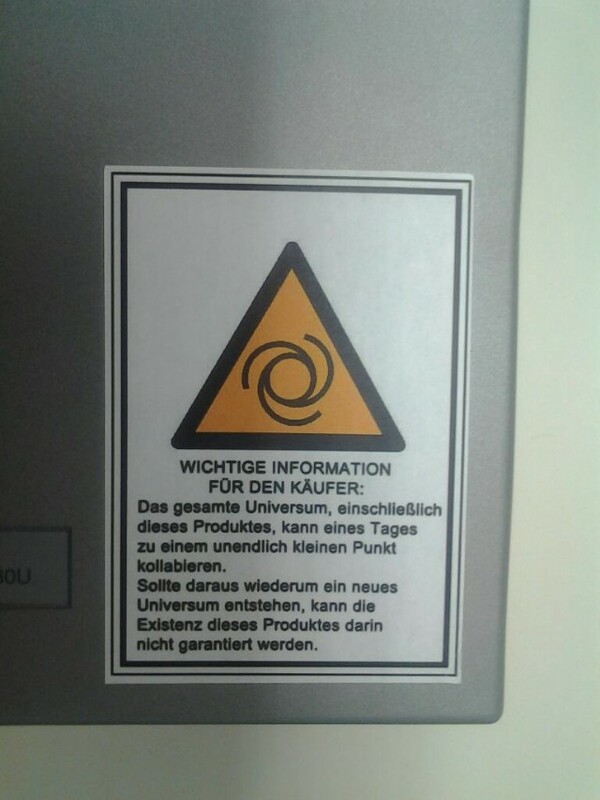 Wie man sieht, ging es vor allem um den Einsatz von Robotern als Katastrophenhelfer. Researchers at three universities have developed a new way of making tough — but soft and wet — biocompatible hydrogel materials into complex and intricately patterned shapes. The process might lead to scaffolds for repair or replacement of load-bearing tissues, such as cartilage. It could also allow for tough but flexible actuators for future robots, the researchers say. Zhao says the process can produce complex hydrogel structures that are “extremely tough and robust,” but still allow for encapsulating cells in the structures. 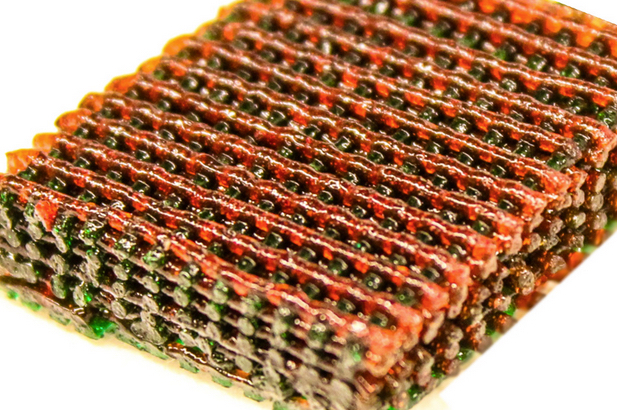 That could make it possible to 3D-print complex biostructures. Hydrogels are defined by water molecules encased in rubbery polymer networks that provide shape and structure. They are similar to natural tissues such as cartilage, which is used by the body as a natural shock absorber. While synthetic hydrogels are commonly weak or brittle, a number of them that are tough and stretchable have been developed over the last decade. However, making tough hydrogels has usually involved “harsh chemical environments” that would kill living cells encapsulated in them, Zhao says. The new hydrogel materials are generated by combining polyethylene glycol (PEG) and sodium alginate, which synergize to form a hydrogel tougher than natural cartilage. The materials are benign enough to synthesize together with living cells — such as stem cells — which could then allow high viability of the cells, says Zhao, who holds a joint appointment in MIT’s Department of Civil and Environmental Engineering. Previous work was not able to produce complex 3-D structures with tough hydrogels, Zhao says. 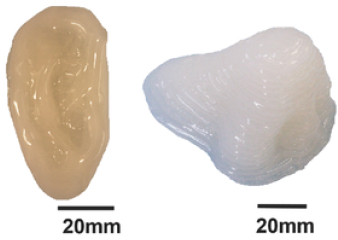 The new biocompatible tough hydrogel can be printed into diverse 3-D structures such as a hollow cube, hemisphere, pyramid, twisted bundle, multilayer mesh, or physiologically relevant shapes, such as a human nose or ear. The new method uses a commercially available 3D-printing mechanism, Zhao explains. “The innovation is really about the material — a new ink for 3-D printing of biocompatible tough hydrogel,” he says, specifically, a composite of two different biopolymers. The PEG material provides elasticity to the printed material, while sodium alginate allows it to dissipate energy under deformation without breaking. A third ingredient, a biocompatible “nanoclay,” makes it possible to fine-tune the viscosity (how easily it flows) of the material, improving the ability to control its flow through the 3D-printing nozzle. Such materials might eventually be used to custom-print shapes for the replacement of cartilaginous tissues in ears, noses, or load-bearing body joints, Zhao says. Lab tests have already shown that the material is even tougher than natural cartilage. The technique could also be applied to printing a variety of soft but tough structural materials, he says, such as actuators for soft robotic systems. “This is really beautiful work that demonstrates major advances in the utilization of tough hydrogels,” says David Mooney, a professor of bioengineering at Harvard University who was not involved in this work. “This builds off earlier work using other polymer systems, with some of this earlier work done by Dr. Zhao, but the demonstration that one can achieve similar mechanical performance with a common biomedical polymer is a substantial advance. The work was supported by the National Institutes of Health, the Office of Naval Research, AOSpine Foundation, and the National Science Foundation. A 3D printable and highly stretchable tough hydrogel is developed by combining poly(ethylene glycol) and sodium alginate, which synergize to form a hydrogel tougher than natural cartilage. Encapsulated cells maintain high viability over a 7 d culture period and are highly deformed together with the hydrogel. By adding biocompatible nanoclay, the tough hydrogel is 3D printed in various shapes without requiring support material. The Strandbeest: Art and Engineering. Created by Dutch artist Theo Jansen, the Strandbeest is created by rudimentary objects such as PVC piping, wood and sails and contains no electrical or motorised parts; it is instead powered by the wind. The Strandbeest has steadily evolved into more complex working structures. Some even having the ability to store wind power in the absence of a breeze, being able to nail pins into the sand when wind power becomes too great, and even sensing when they have entered the water or encountered an object so they can then avoid the obstruction. Theo Jansen is ever improving and changing these creatures, and does have a final plan for them saying: “over time, these skeletons have become increasingly better at surviving the elements such as storms and water, and eventually I want to put these animals out in herds on the beaches, so they will live their own lives”.